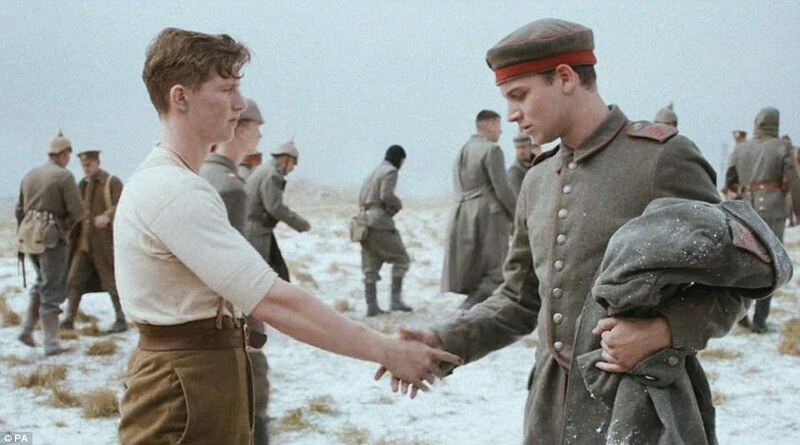 The overlap between fiction and history – where this blog comes in – is perhaps nowhere more clearly seen than in the depiction of an event that happened a hundred years ago tomorrow – the Christmas truce of the First World War. The truce became the stuff of mythology almost as soon as it happened, and in the century since, all sorts of refining and expanding of the facts has gone on; films and plays have dramatized it adding fictional truth to the mix, and this year, even advertisers got in on the act with Sainsburys running a Christmas ad featuring a pot-pourri of elements common to many first-hand accounts of the Christmas Truce. The truce started, apparently, with a song on a crisp, clear night ─ December 24th, 1914. The weather up till then had been wet, but temperatures dropped on Christmas Eve and a hard frost settled on the trenches of the Western Front. During the afternoon British soldiers noticed miniature Christmas trees with candles and paper lanterns appearing along the German parapets. And then, coming up to seven in the evening, the German soldiers began to sing. “I shall never forget it, it was one of the highlights of my life. I thought, what a beautiful tune,” Private Albert Moren of the Second Queens’ Regiment recalls. Stille Nacht – or Silent Night – is the carol most associated in the popular imagination with the first – and only ─ Christmas truce of the First World War. But soldiers’ recollections suggest other carols played a more prominent part in the event. Rifleman Graham Williams of the Fifth London Rifle Brigade admits he’d never heard of Silent Night. This is quite possible since it was not as common a carol then as it has become now. So it was Come All Ye Faithful that stuck in Williams’ mind because it was a tune both sides knew, although the German troops sang the Latin version – Adeste Fideles. The soldiers found common cause in hymns and carols, anthems and parlour songs. On that Christmas Eve, there were renditions of Home Sweet Home, It’s a Long Way to Tipperary, The First Noel, Auld Lang Syne, While Shepherds Watched Their Flocks and O Tannenbaum, as well as God Save the King and Die Wacht am Rhein. The music was the precursor of something much more revolutionary, however – an unofficial and illicit truce. It’s estimated that about 100,000 soldiers participated in the truce. Despite the scale of it, or perhaps because of it, there was a widespread belief that it was a story concocted for propaganda purposes. In some quarters it came to be regarded as a “latrine rumour”. Pat Collard wrote to his parents that the truce was “all lies. The sniping went on just the same; in fact, our captain was wounded, so don’t believe what you see in the papers”. Pte Collard’s experience was also true. The truce was widespread, but it was not total. In some parts of the Western Front, shelling and firing continued and so did the fatalities; a total of 98 British soldiers were killed on Christmas Day 1914. The first overtures were generally made by German troops, perhaps because Christmas Eve is the focus of festive celebrations in the German tradition. Nevertheless, there was strong resistance within the German ranks to fraternizing with the enemy. One soldier, a certain Corporal Adolf Hitler of the 16th Bavarians, berated his comrades for unmilitary conduct. “Such things should not happen in wartime. Have you Germans no sense of honour left at all?” he asked. Historians have grappled with the question of what if – what if the truce had held. Stanley Weintraub, author of Silent Night: The Story of the World War 1 Christmas Truce, has suggested that the unsanctioned revolt by thousands of ordinary soldiers had the potential to be one of those “spontaneous movements that topple tyrants and autocrats” but in the end, military discipline reasserted itself. Very soon it was business as usual. A version of this post was broadcast as part of Christmas Miscellany, December 21, on RTE Radio One. I am grateful to the excellent and authoritative site, http://www.christmastruce.co.uk, for certain quotes that appear here.